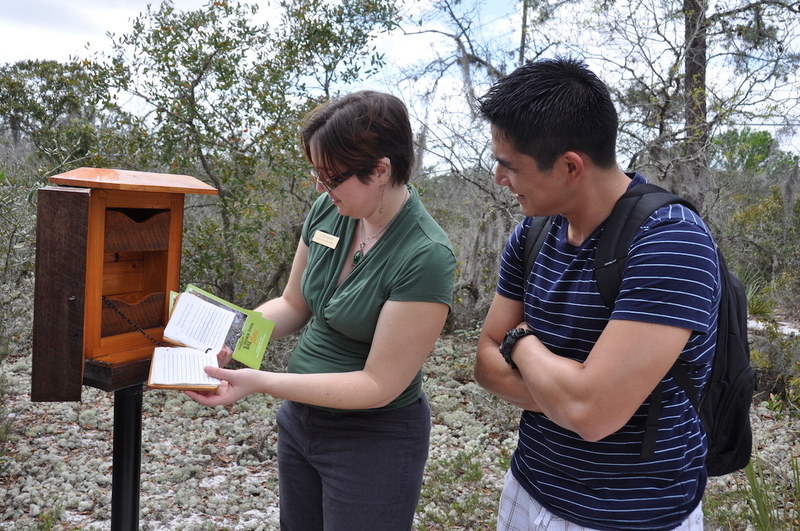 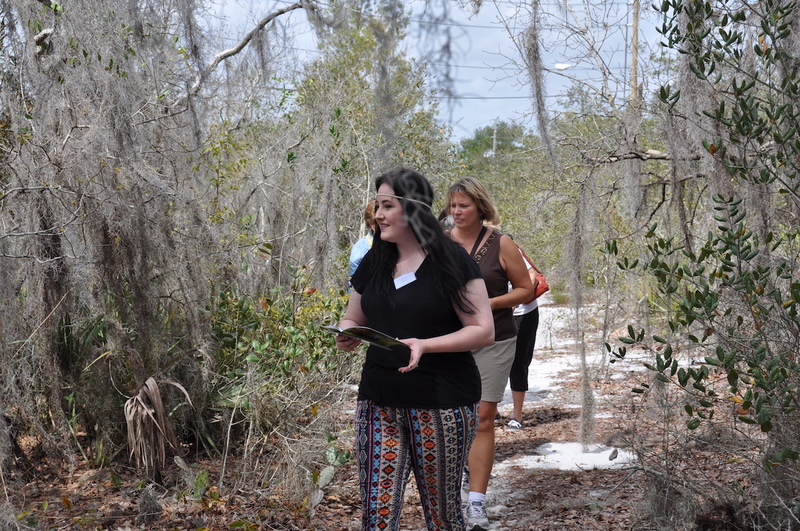 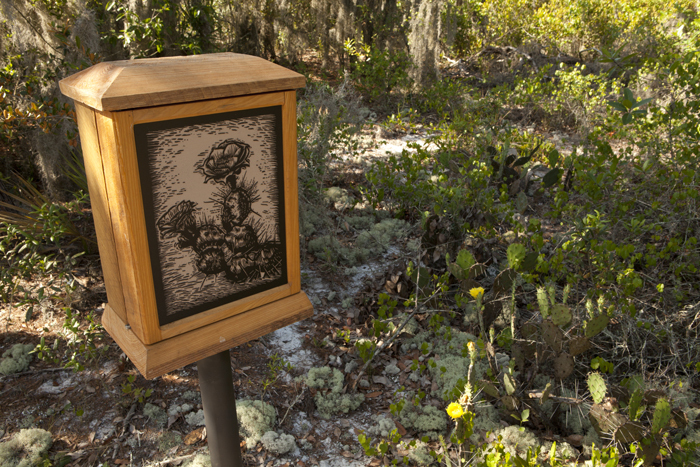 Science, art, and the natural world come together in the Wildflower Wayside Shrine Trail , a self-guided walking trail that explores pristine scrubland on the South Florida State College Highlands Campus. 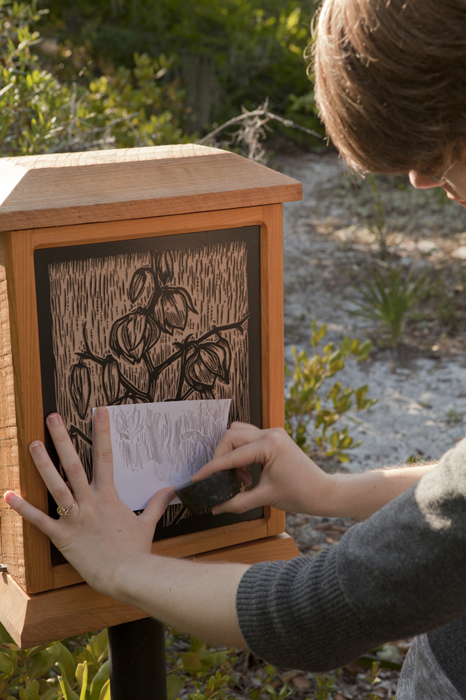 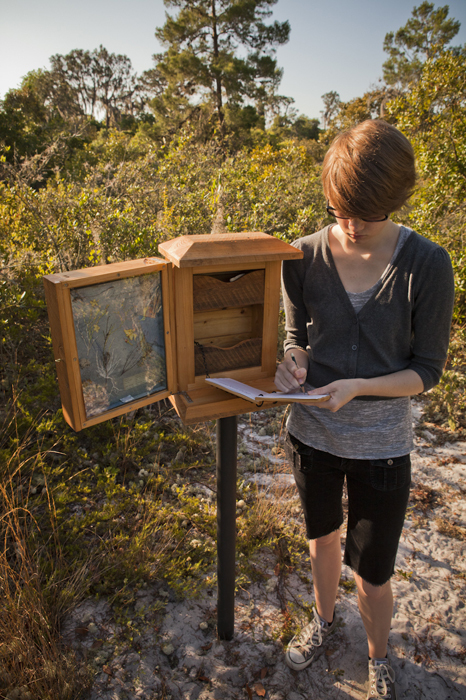 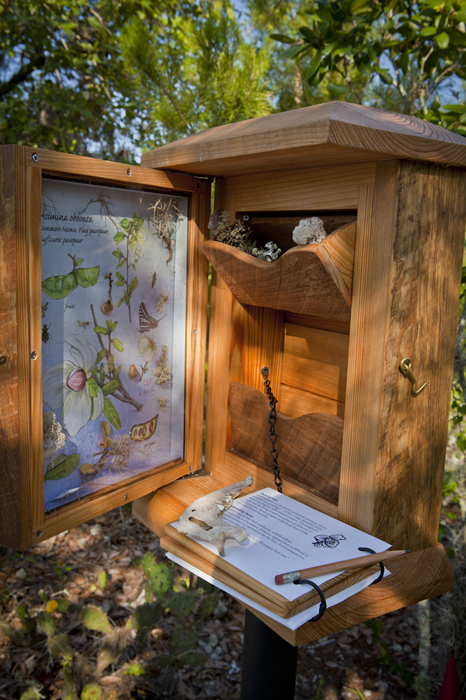 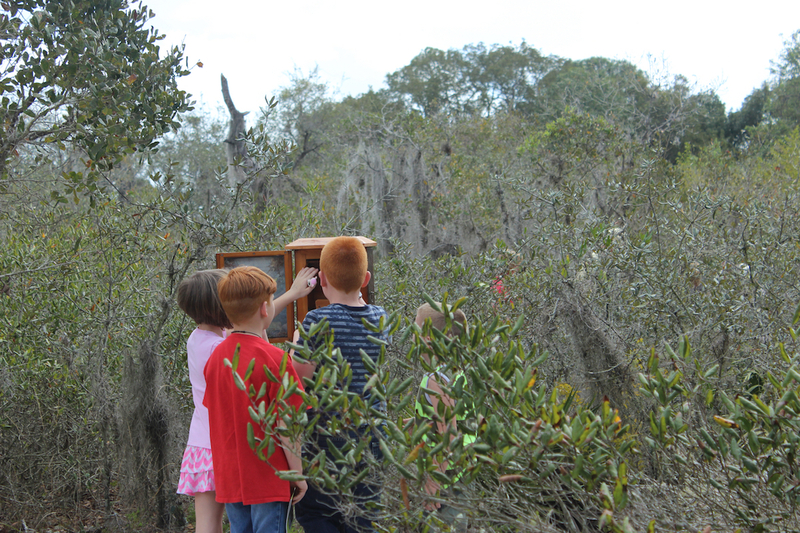 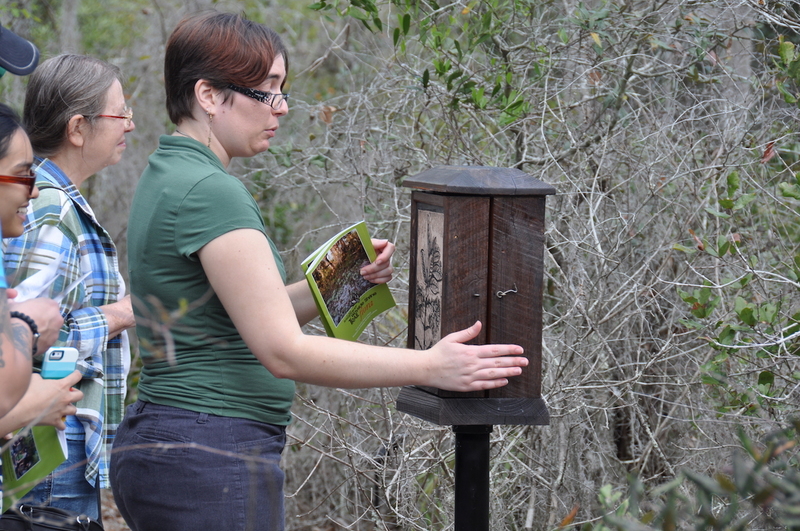 Developed through a partnership between the SFSC Museum of Florida Art and Culture (MOFAC) and Archbold Biological Station, Lake Placid, Florida – and several years in the making – the Wildflower Wayside Shrine Trail fosters environmental preservation and education by setting aside a portion of this unique and rapidly dwindling ecosystem for scientific observation, artistic inspiration, and reflection. 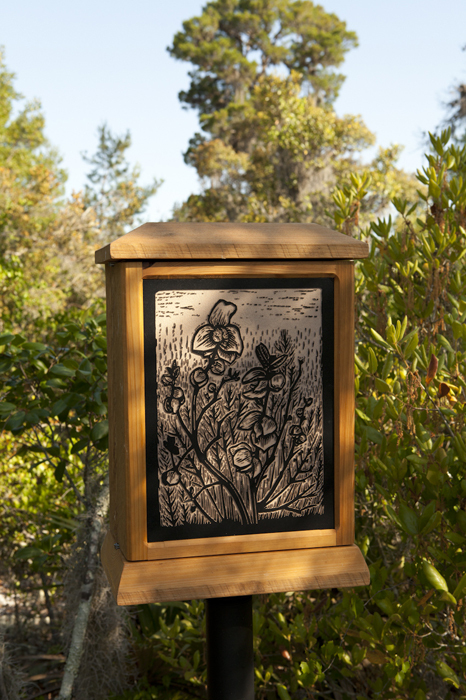 Mollie conceived the trail from her own exploration of the natural world and from the indigenous shrine boxes she encountered while studying the culture of India. 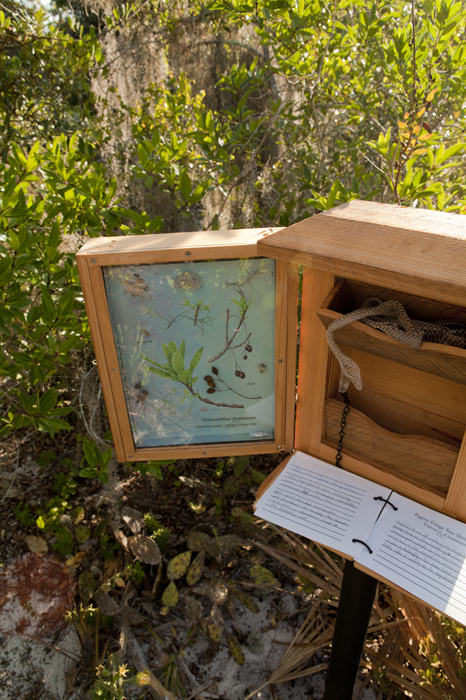 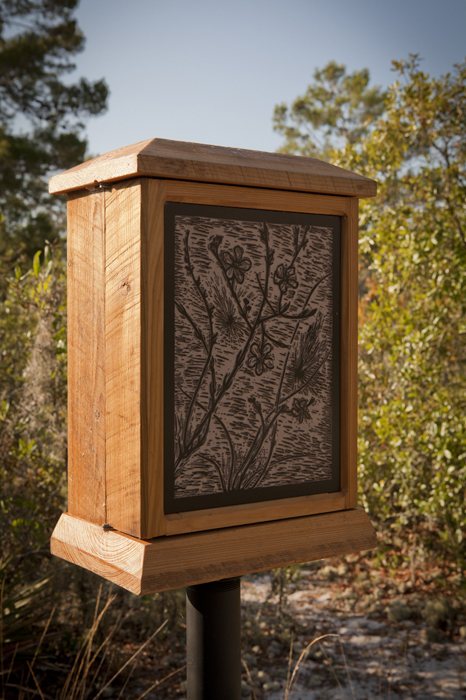 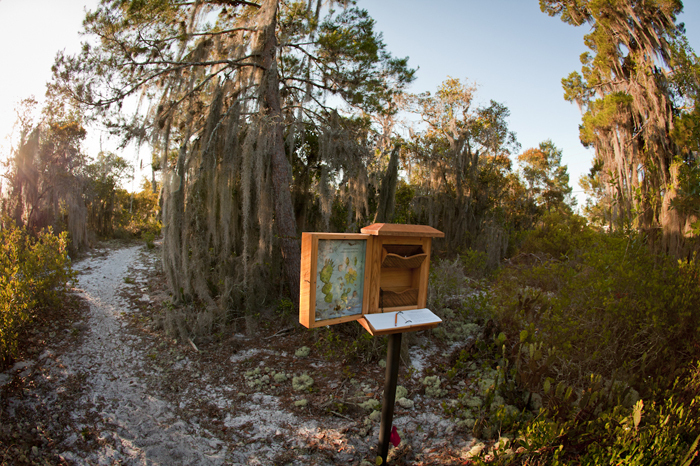 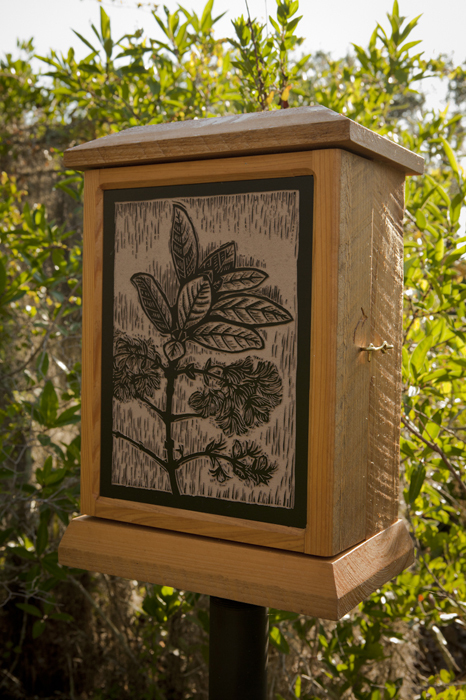 Along the Wayside Shrine Trail are nine shrine boxes, created by Mollie to honor the endangered plant species found on the Lake Wales Ridge. 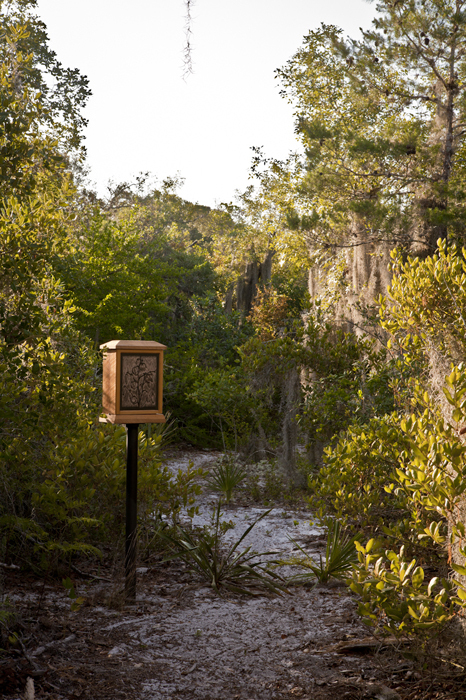 Six shrine boxes are located on the SFSC campus and three boxes will be located at Archbold Biological Station in the near future. 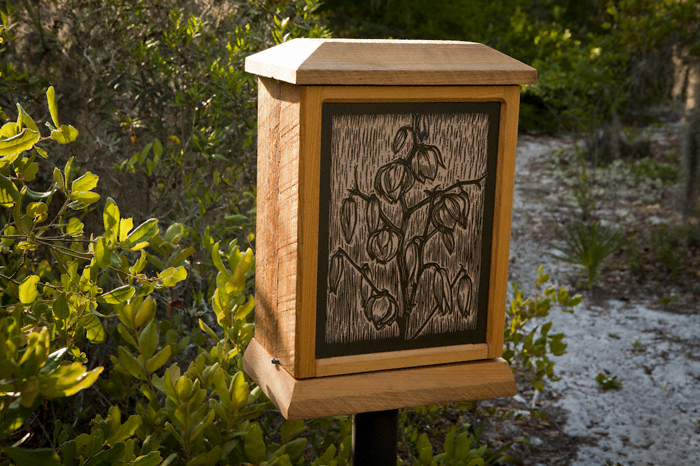 The shrine box covers are reproductions of original carved wood blocks. 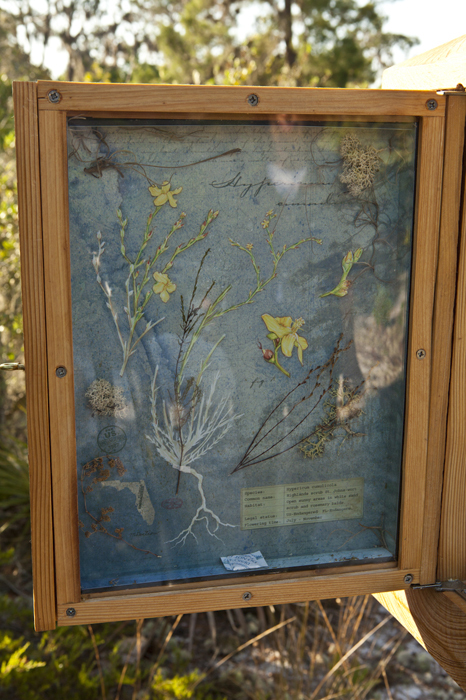 Inside the shrine boxes are botanical shadow boxes and journals that tell about the plants. 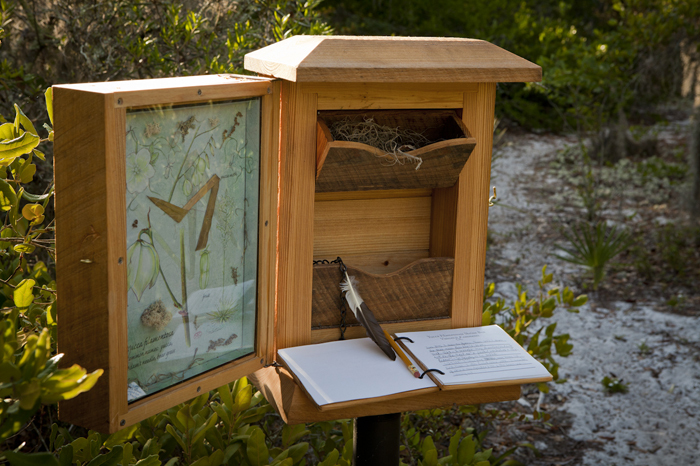 Visitors are encouraged to write in the shrine journals, thereby sharing their impressions with their fellow travelers, and to make rubbings of the shrine boxes as mementos of their visits. 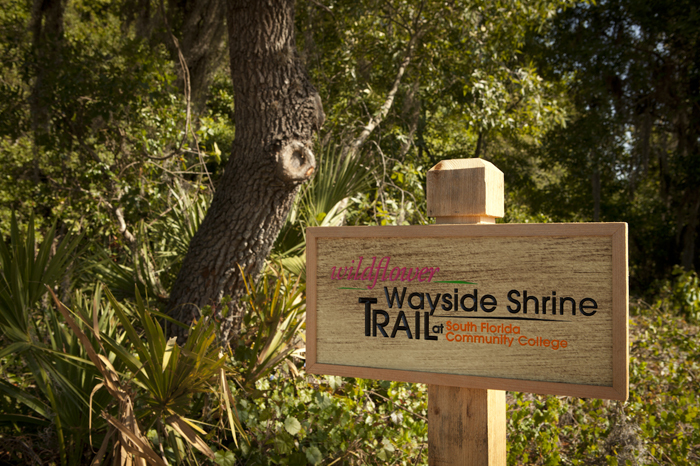 View the Intro to Wildflower Wayside Shrine Trail video. 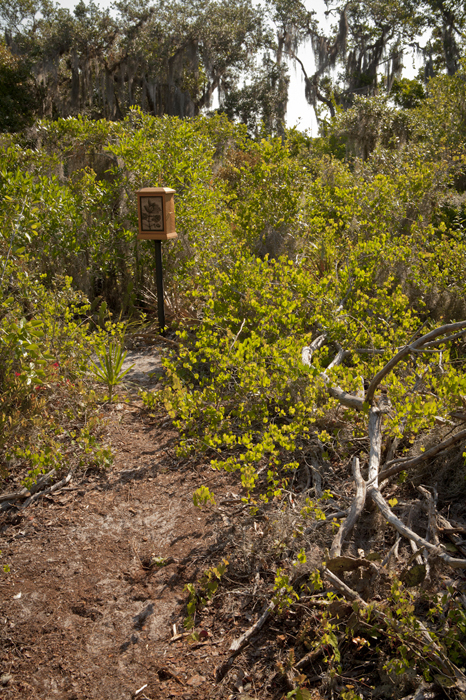 See more about the trail on the video, Greater Everglades Conservation Atlas: Lake Wales Ridge. 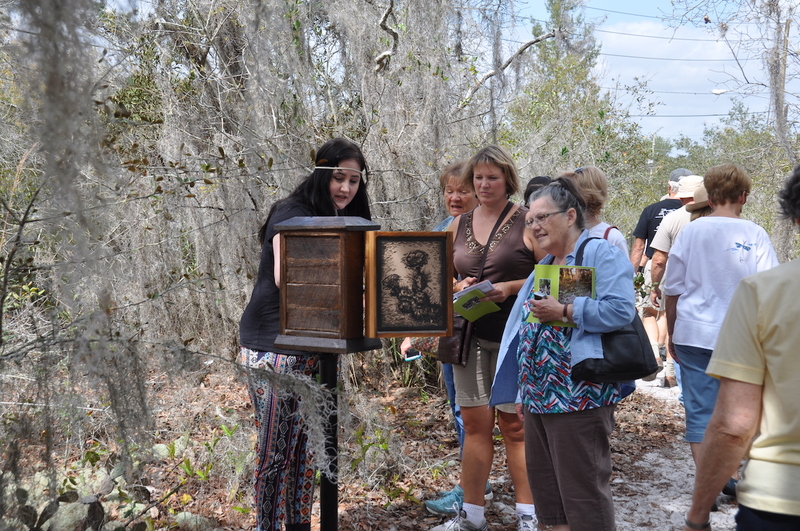 See other pictures on the trail Facebook page.